My five-times Great-grandfather John Cooper of Cumberland County, PA, is one of the more mysterious ancestors in the Cooper-Pearce family tree. We have no definitive ancestors for him. One source has his middle name as Cremer, back when middle names were rare. Another thinks his wife Mary Jane was actually Mary Ann. All this is to say that genealogists often disagree. Every so often primary documents are uncovered that strongly confirm earlier beliefs. 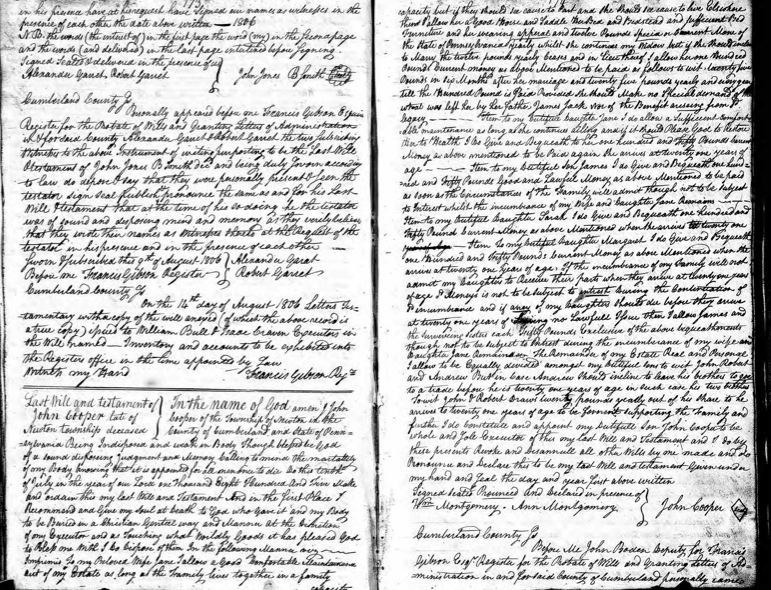 The Last Will & Testament (written in 1805 & probated in 1806) of our John Cooper goes a long way toward confirming such: the names of his spouse and children, the place and date of his residence and death, and his family values in sharing his estate. However, it’s not unusual that many questions arise in transcribing and interpreting such a document in light of our earlier beliefs: how did 55-year old father John and five of his sons die in the same year? Did these tragedies “inspire” John to writing the will and further provide for his survivors? Being that 5-year old son William is not named in the document, did he die earlier in the year the will was written? Why was his 11-year old son named executor? Why did he seem to treat his sons differently from his daughters in distributing the estate? Above all, what was 19-year old daughter Jane’s medical condition that John provided for her special care? Were witnesses to the will, William and Ann Montgomery, relatives, perhaps John’s sister and husband or cousins, or just friends or neighbors? Imagine the fascination I experienced, a quarter-century after the American Revolution, hearing Great-grandfather John talk in terms of Pennsylvania Pounds, “or current money of Pennsylvania.” A quick look at Wikipedia shows the United States’ official conversion to the dollar a decade earlier, but no doubt citizens on the frontier were slow make the “change” in their vocabulary. 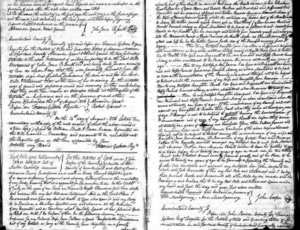 Nevertheless, using a conversion table linking the late 18th century to now in terms of the time value of money, the value of John’s bequests would be hundreds of thousands of dollars by today’s standards. Despite being so generous, it’s understandable why he stipulated “no interest” on any delayed gifts. My wife took exception to John “allowing” his wife “a good horse and saddle; the bed, bedstead, and sufficient bed furniture; and her wearing apparel” if “she should see cause to live elsewhere.” Having read other wills of the day, including those of her own ancestors, I assured her that this was common thinking and practice. Furthermore, generous John, setting financial conditions for her possible re-marriage, though cutting off her stipend, “a good, comfortable maintenance,” gives her an immediate wedding gift and limited annual “salary.” He cautions her, upon his death, not to try to collect more from her late father, Captain James Jack, a veteran of the Revolution whose family was probably on pension. Last Will & Testament of John Cooper, late of Newton Township, deceased. In the name of God, amen. John Cooper of the Township of Newton, in the County of Cumberland, and State of Pennsylvania, being indisposed and weak in body, though blessed by God of a sound disposing judgement and memory, calling to mind the mortality of my body, knowing that it is appointed for all men once to die, do this tenth of July in the year of our Lord, One-thousand Eight-hundred and Five, make and ordain this my last Will and Testament. To my beloved wife Jane follow (?) a good comfortable maintenance out of my estate as long as the family lives together in a family capacity, but if they should see cause to part and she should see cause to live elsewhere, then I allow her a good horse and saddle, the bed and bedstead, and sufficient bed furniture and her wearing apparel and twelve pounds special [?] or current money of Pennsylvania whilst she continues my widow, but if she should decide [?] to marry, the twelve pounds yearly ceases and in lieu thereof, I allow her one hundred pounds in six months after her marriage and twenty-five pounds yearly and every year till the hundred pound[s] is paid, provided she should make no special demands of what was left her by her father James Jack nor of the benefit arising from [said?] legacy. Then to my dutiful daughter Jane, I do allow a sufficient comfortable maintenance as long as she continues ailing, and if it should please God to restore her to health, I do give and bequeath to her one-hundred and fifty pounds current money, as above mentioned, to be paid again [when?] she arrives at twenty-one years of age. Then to my dutiful son James, I do give and bequeath one-hundred and fifty pounds good and lawful money, as above mentioned, to be paid as soon as the circumstances of the family will admit, though not to be subject to interest whilst the encumbrance of my wife and daughter Jane remains. Then to my dutiful daughter Sarah, I do give and bequeath one-hundred and fifty pounds current money, as above mentioned, when she arrives to twenty-one [years of age – crossed out]. Then to my dutiful daughter Margaret, I do give and bequeath one-hundred and fifty pounds current money, as above mentioned, when she arrives at twenty-one years of age, if the encumbrance of my family will [not?] admit my daughters to receive their parts when they arrive at twenty-one years of living [? ], no lawful [unclear] then I allow James and the surviving sisters each fifty pounds exclusive of the above bequeathments, though not to be subject to interest during the encumbrance of my wife and daughter Jane remains. before me, John Boden, Deputy for Francis Gibson, Esq., Register for the Probate of Wills and Granting Letters of Administration in and for said County of Cumberland, personally come William Montgomery and Ann Montgomery, the two [unclear – jubsorebing?] witnesses to the above and foregoing instrument of writing, purporting to be the last will and testament of John Cooper, deceased, and being duly sworn according to law, depose and say that they saw the testator sign, seal, publish, pronounce, and declare the said testament as and for his last will and testament, that at the time of so doing, he was of sound and disposing mind and memory, that they wrote their names thereto as witnesses in the presence of the testator at his request and in the presence of each other. Before me John Boden, D.A. on the 12th day of August AD 1806 Letters Testamentary issued with a copy of the will (of which the foregoing record is a true copy) to John Cooper, Executor named in the will. Inventory [unclear?] to be exhibited in the Register’s office in the time appointed by law.